Be is on the road, bustling public place, cinema theatre, place of worship or even corridors of Office – you find people glued to their smart phone and walking without caring to look at anything else ....... Away, this advertisement was irritating to say the least – the so called ‘Axe effect’ drawing women in hordes to a male who has sprayed himself liberally with the Axe deodorant. The Axe brand of deodorants from Hindustan Unilever primarily targetted at 15 to 25 year old males. ..... and this one newsitems attracted more ..... "Unable to attract even a single girl, frustrated man sues Axe" - this was published in many websites too including TOI itself. The news was not real though !!! Faking News, originally started as a form of blog, is a news satire website that publishes fake news reports containing satire on politics and society of India; it was launched in Sept 2008. In May 2013, it was announced that Faking News had been acquired by Network 18-led First Post. In 2009, Fake IPL Player had created a much buzz. The blog was controversial from the start, giving unflattering nicknames to players, coaches, and owners of KKR and other teams, telling sordid stories, and showing most of them in a very negative light. As the blog rapidly became popular, it was believed to be of a fringe KKR player who was upset at not being part of the core team. The blog worsened an already bad season for KKR, which lost most of their games, had controversies surrounding their coach, John Buchanan, and frequently changed captains. In that 2009 season in South Africa, two KKR players, Aakash Chopra and Sanjay Bangar, were sent home to India midway through the tournament. This fuelled speculation that they were suspected of being the person behind the blog. The team was also rumoured to have banned use of laptops by players. Later it was revealed that it was not any player but a technie Anupam Mukherjee. Getting back to the ‘Faking News of First Post’ – there was an interesting news item on Sept 10, 2014 – titled – ‘Government announces new lane for people who like to text while walking’. It read – newly appointed BJP government took another public-friendly step today when the Road Transport and Highways Minister Nitin Gadkari announced a new lane on all the roads of the country for the people who like to chat on their phones while walking. “People’s safety is the biggest priority for us. We don’t want people clashing with each other on the middle of a road anymore,” Nitin Gadkari said while making the announcement. Apparently, only people with smart-phones in their hands will be allowed to walk on these special lanes. There’ll be CCTV cameras installed to avoid any kind of misuse of the privilege provided by the ministry. “If someone is caught watching the road while walking on these specific lanes, we’ll surely penalize them or even jail them if needed,” an official told Faking News. “The phenomenon of texting while walking has become more prevalent as our society has become dependent on smart-phones and other hand-held devices for sharing creepy Good Morning Dear stickers and yes this is me and my pimples selfies readily accessible information. When people walk with their head down and not focused on the scenery in front of them as they text and play video games, the potential for disaster unfolds. This problem isn’t generally discussed as much as distracted driving or texting while driving however the danger is just as real. Therefore we’ve taken this step,” Nitin Gadkari stated. On this lane, people will not have to worry about the stupid pedestrians who move faster and force them to move faster as well just to get to their work. One can concentrate and share everything with their friends and the people they know nothing about. One can share all their problems or their happy moments like how good a bowel movement they had in the morning. “We know that the government is failing to create jobs, but after this announcement, the jobless people will have something to rejoice about. Just imagine, you can reach your destination and clear a Candy Crush level at the very same time without getting hit by a vehicle or a telephone poll,” Nitin Gadkari further added. 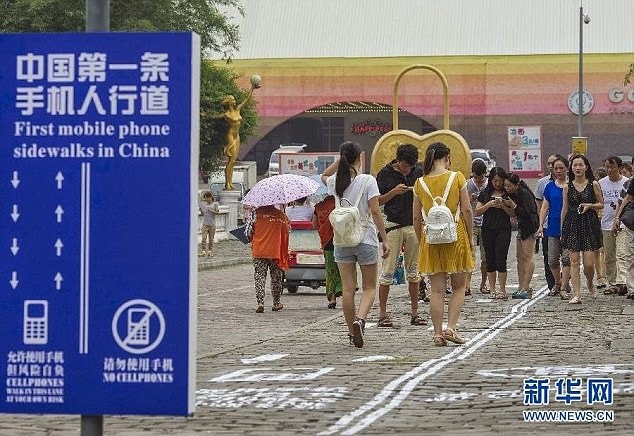 The 100ft stretch of pavement in Chongqing has a mobile phone lane; it was set up because of the huge number of people addicted to their phone - yes the 100ft-stretch of pavement created in Foreigner Street in the Chinese city of Chongqing has a lane specially painted for people who have their eyes glued to their screens. It has a picture of a phone etched on the ground, the word 'cell phone' written down and a thick white line separating it from the rest of the pavement. The lane was set up in response to the growing number of people who are addicted to their phone - which is a major issue in China. The idea for the mobile phone lane, on Foreigner Street, appears to have been copied almost exactly from a project by a television programme on the National Geographic channel earlier this year. That programme found only a few people changed which side of the pavement they walked on after spotting the signs. However, officials in China said the markings would help to quietly remind pedestrians that 'it is best not to play with your phone while walking'.